"For when the intellect sends forth its concepts clearly and with judgment, those concepts will make hands that have exercised disegno for many years understand both the perfection and excellence of the arts and the expertise of the artist." "All the Arts belong to disgeno or depend on it." "As long as art lives never shall I accept that men are truly dead." "Inspiration demands the active cooperation of the intellect joined with enthusiasm, and it is under such conditions that marvelous conceptions, with all that is excellent and divine, come into being." According to scholar Leon Satkowski, Vasari's early schooling was "uncustomarily rich in classical studies," which would later support the artist's advocacy for the Classical underpinnings of the Italian Renaissance. Fluency in Latin was considered a cornerstone of Arezzo public education, and by the age of twelve Vasari could recite long passages from Virgil's Aeneid from memory. In Arezzo, Vasari also learned drawing techniques from Guillaume de Marcillat, a French craftsman, stained glass artist and panel painter. Yet despite being raised within such a long line of artisans, and despite his refined early schooling, Vasari would need to move to Florence if he was to develop true expertise in the fields of art and architecture. By 1524, Vasari left Arezzo to take up a Florentine apprenticeship. This opportunity arose as a consequence of Vasari's family ties to the Medici family, an Italian banking family and political dynasty who were at that time the most influential of all the patrons of the arts. Vasari enjoyed additional patronage from one Silvio Passerini, Cardinal of Cortona, papal legate to Florence, and tutor to Medici heirs Ippolito and Alessandro. Passerini had visited Arezzo in 1523 and had been so moved by the boy's recitation of the Aeneid, and so admiring of the promise he showed in his drawings, that Cardinal extended an apprenticeship invitation to the young Vasari. Once in Florence, Vasari studied literature alongside the Medici heirs, and trained in Michelangelo Buonarroti's workshop. Though Vasari's apprenticeship with Michelangelo lasted only a matter of months, his esteemed tutor was sufficiently taken with the young apprentice's talent that he secured a place for Vasari in the painter Andrea del Sarto's workshop in 1525. 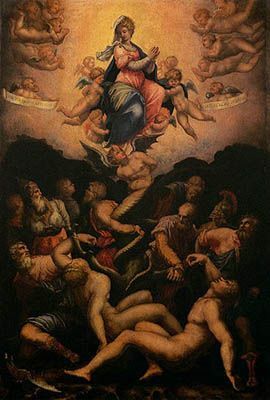 Vasari preferred the training he received under Michelangelo and was frustrated with what he felt was del Sarto's wife Lucrezia's interference with the studio's working environment. Vasari soon left del Sarto's employ for a short-lived spell in the workshop of sculptor Baccio Bandinelli, an artist who Vasari came to despise (and who he vilified in the 2nd edition of The Lives of the Most Eminent Painters, Sculptors and Architects). In 1527 Vasari's father succumbed to the plague. The 16-year-old took over responsibility for the management of the family's financial affairs and he learned out of necessity to be meticulous in his accounting. Though something of an unwelcome responsibility at the time, the experience helped him appreciate the financial security that artistic status could bring. According to Satkowski, Vasari "set out early and deliberately to make himself an artist of influence," surrounding himself indeed with authors, architects, and artists of renown and developing a shrewd eye for cultivating patrons. In 1531 Vasari's Florentine friend and former schoolmate, the now Cardinal Ippolito de' Medici, asked the artist to join him, Vasari's close friend Francesco Salviati, and the Medici entourage in Rome. Vasari viewed this time in Rome as his golden age, where he and his colleagues spent their days drawing and studying Roman ruins, monuments, buildings, statues and the Vatican's Raphael and Michelangelo frescoes. A year later, the 21-year-old Vasari joined the Florentine painters' guild and he would become instrumental in elevating the guild's prestige. Scholar Leon Satkowski presents a biographical picture of Vasari as something of a narcissist. He was on the one hand "loyal, hard-working, and totally committed to the political aspirations of his patrons." On the other, he was known to have an "obsequious personality" which "did not make him universally popular". Vasari could be at once "confident," "proud," "hypersensitive to criticism," and "desirous of recognition and respectability." He could also show a level of impatience that "bordered on paranoia." When combined, these "qualities" would account for his impressive professional savvy. Vasari's employ with the Medici family was long-standing, and profitable both for his family - the Medici family sponsored one of his sister's dowries, for instance - as well as for him personally. In 1536, Alessandro de' Medici paid Vasari four hundred ducats for his work, and also, according to Ingrid Rowland and Noah Charney, "assigned him the revenue from fines levelled at artists who failed to fulfil their commissions, a further three hundred ducats a year": Vasari had become a financial success at the age of only 25. 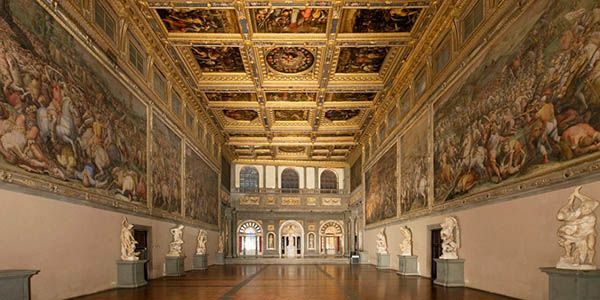 There is a popular argument that Vasari might have been a better architect than painter. However, according to Satkowski, Vasari "lacked conventional training in architecture and came to it relatively late in his distinguished career." 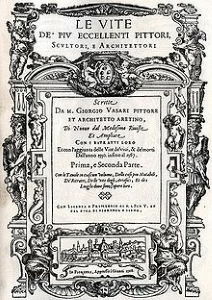 His interest in architecture arrived first through personal experience with architectural masterworks and architects; his training as a painter and his Classical background would have also exposed him to imagery of architectural works and the works of Vitruvius, whose work was translated into Italian vernacular in 1521. According to Vasari himself, it was only in his twenties (c. 1536) that he sought out formal study of architecture. 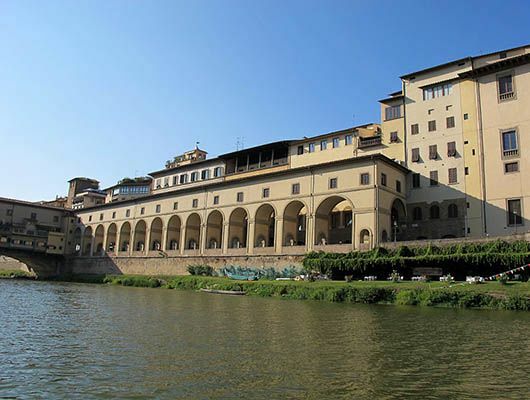 Vasari's buildings are characterized by their diversity in type, meanings, and style. He placed particular emphasis on his buildings' symbolism and conceptual ideas, and, in Satkowski's terms, provided "virtuoso solutions to the complexities posed by their urban sites." In 1550, Vasari published his seminal text, The Lives of the Most Eminent Sculptors, Painters, and Architects, in collaboration with his friend Vincenzo Borghini as well as local experts. Despite its manifest shortcomings, the text crystalized the ideology of the Renaissance as the aesthetic progression out of the Dark Ages of the Medieval era and into an enlightened return to Classical ideals. It became a cornerstone of art historiography and the periodization of the Renaissance style. Vasari had conceptualized The Lives of the Most Eminent Sculptors, Painters, and Architects around 1545, using both Plutarch's Parallel Lives (100 AD), which compared Greek to Roman notable men, and Vitruvius' Ten Books of Architecture (30-15 BC) as his key inspirations. The Lives was thus envisioned as an ideological foundation for a Florentine art school. 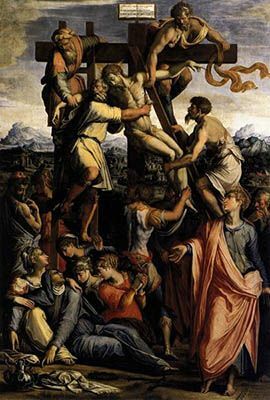 A second edition of The Lives was published in 1568 and, in this version, Vasari afforded Venetian artists (including Titian) their rightful place in the development of the Renaissance. 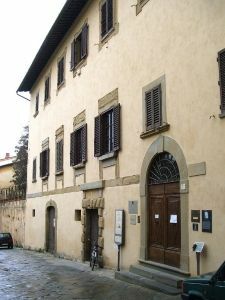 Vasari had hoped that his original tome would guarantee his application to join Duke Cosimo de' Medici's court, though that honor would be denied him until 1554. Given his difficult personality, Vasari was ripe for criticism and public reproach. Around the time of the first publication of The Lives, there were public accusations, in Satkowski's words, of "insalubrious habits," as well as concerns that the architect was imbibing of too much wine and becoming careless with money. These accusations, regardless of their authenticity, posed a risk to Vasari's career because they called into question his credibility and moral fitness for the first time. With important commissions now under threat, Vasari needed to shore up his public standing, and though "psychologically ill-prepared" and warned off doing so by his peers, Vasari wed Nicolosa Bacci, the daughter of a prominent apothecary in Arezzo, in 1550. Vasari had previously had an affair with Nicolosa's sister Maddalena, with two children resulting from this premarital union. His marriage to Nicolosa came in fact hard on the heels of Maddalena's death. Yet despite the views of the naysayers, and though often apart, Vasari was fond of his wife and was rueful of the fact that their union remained childless. Vasari's architectural career truly began after his admittance into the Duke Cosimo's court (in 1554), and he designed and executed many buildings and city plans both for Cosimo and for the Pope. He would also remodel church interiors, amongst them, the Gothic Church of Santa Maria Novella in Florence, which, under the instruction of the Council of Trent, he rebuilt with the aim of bettering the congregation's ability to see and hear the services. Vasari also took on the task of designing, rebuilding, and organizing the Palazzo della Signoria in Florence, which included Cosimo's private quarters, his assembly rooms, and the offices destined for his administrators, the Uffizi. 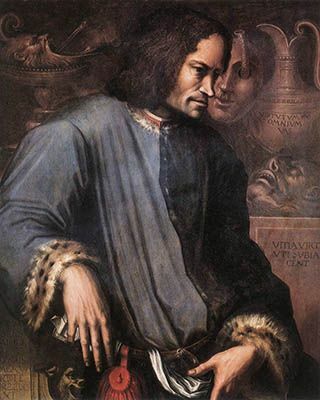 Vasari was subsequently instrumental in ensuring that Duke Cosimo approve the establishment of the Accademia e Compagnia dell'Arte di Disgeno. The Accademia took its model of an ideal artist and its educational program from The Lives and aspired to educate artists in artistic skills as well as in literature and science. From Pope Pius V, Vasari received the honor of becoming a Knight of Saint Peter in 1571. 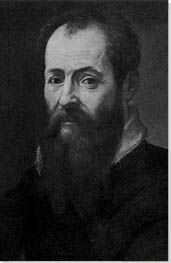 Vasari died on June 27, 1574 at the age of 63. He was buried in a chapel he had designed for himself in the church of Santa Maria in Arezzo. 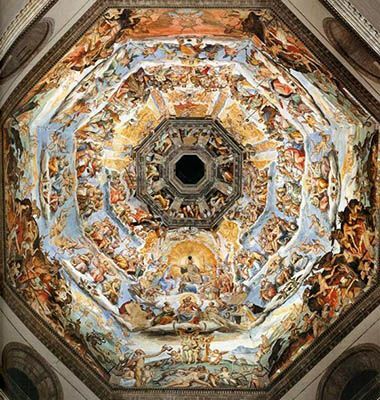 Vasari's greatest legacy is his 1550 text, The Lives of the Most Eminent Sculptors, Painters, and Architects, a seminal document which contributed to the formation of art history as a viable academic discipline. 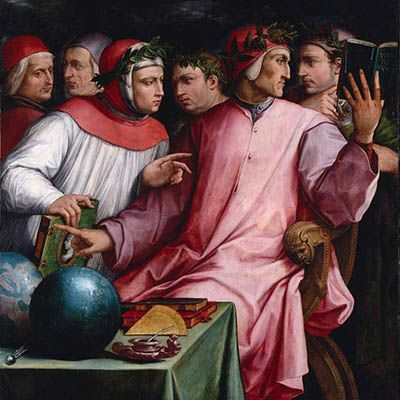 From then till now, artists and scholars have drawn on The Lives as an important, albeit problematic, and often apocryphal, guide to the Italian Renaissance and its origins. Annotated copies of The Lives have been found in the libraries of artists such as El Greco, Annibale Caracci, and Frederico Zuccaro, and its alphabetical recordings of artist biographies ensured that there is a record of female Renaissance artists who might have otherwise been neglected: including Sofonisba Anguissola and her sisters, and Properzia de' Rossi of Bologna. The Lives used each artist's biography as an entry point to understand his or her work, a technique which was unique in Vasari's time but now a commonplace art historical methodology. Vasari structured each of his artist profiles within an identifiable progression, beginning with the artist's birthplace and family history; then rigorous, dedicated training; and then details and anecdotes about professional success and aesthetic significance. Vasari painted a portrait of an ideal artist who was financial savvy and successful, by right, and who conducted himself of herself morally. Scholars Ingrid Rowland and Noah Charney describe the text as "part historical urban legend, part morality tale," as Vasari showed "that talent is not enough to build a career: persistence counts too." Through Vasari, artists transcended their status as mere craftsmen, and instead "became thinkers as well as makers." The Lives was, however, biased towards Tuscan and particularly Florentine artists and artists whose works fit Vasari's ideal. He went someway to remedy his geographical imbalance with his second volume (1568) that acknowledged the role of Venetian artists in the development of the Renaissance. As an avid collector of drawings, Vasari also contributed to the popularization of drawings as worthwhile aesthetic documents, rather than preparatory material to be discarded. He maintained books (now lost) entitled Libri dei Disegni (Books of Drawings) in which he organized and displayed drawings by artists he admired. So the story goes, Vasari saved Michelangelo's drawings from his attempt to burn them over an open fire, an attempt by Michelangelo to conceal from posterity the hard work and preparation that might damage the idea that it was his creative spontaneity that produced his greatest masterpieces.